Everyone remembers being told not to swallow chewing gum when they were a kid. Well, you shouldn’t be swallowing traditional gum but not because it doesn’t break down. The ingredients in gum include aspartame, titanium dioxide, artificial colouring and flavouring to name a few. These are all things you don’t want to be ingesting because they’re simply not good for you. Now there is Mast Chew. It’s 100% natural and organic and contains pestacia resin, an ancient Mediterranean gum from the pistacia be us of trees. Pestacia resin has been used to treat and maintain gut health for thousands of years. 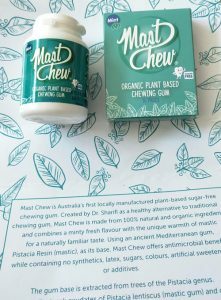 Mast Chew uses this with a mix of xylitol and mint to create a gum that is not only safe to swallow, but also provides additional health benefits. Because it contains no synthetic nasties, Mast Chew is easily digested and has been shown to assist in the treatment of stomach ulcers. It also has antimicrobial benefits, great for dental hygiene. Chewing gum has also been shown to reduce stress, improve memory and decrease hunger. If you’re someone who always has gum with them, why not try an alternative option that also offers health benefits? It tastes good, won’t hurt your gut health, and it’s all natural. Check it out!